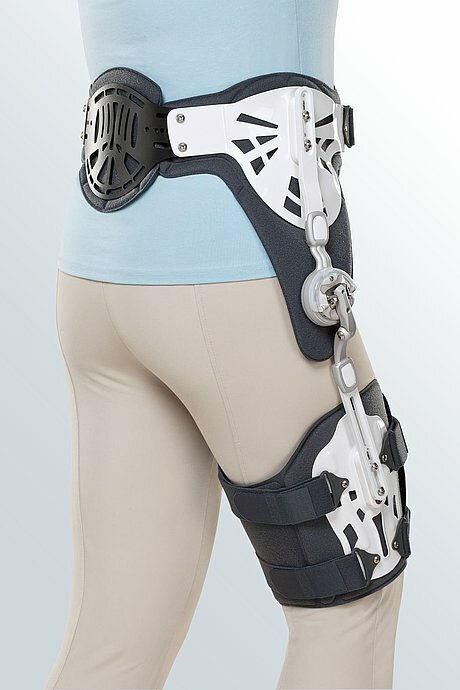 The medi Hip one is a functional hip orthosis. The product is exclusively to be used for the orthotic fitting of the hip and only on intact skin. Please apply orthosis to patient in a standing position. First, open all belts and adjust the joint to the desired range of motion (see "Joint adjustment"). Then close the pelvic restraint. In order to adjust the hip piece to specific dimensions, you can use the four outer screws for dorsal adjustment (see "Adjustment of pelvic restraint") as well as the abdominal binder. Now, adjust the thigh cuff. Make sure that the thigh cuff is centred over the medial femoral condyle and that the joint is at the approx. height of the hip pivot point. Close the thigh cuff belts. Now, adjust the adduction or abduction angles following the physician's instructions (see "Adjustment of adduction and abduction"). Figure 3 shows a correctly applied Hip one. Then verify that all screws have been tightened. This should be done in regular intervals. Loosening the four dorsal screws enables the adjustment of the pelvic restraint width within the elongated holes. Once again, tighten all screws. 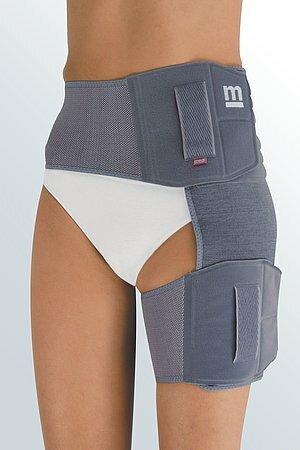 Loosen the screws of the joint support splint around the pelvis and thighs. Now you can adjust the joint height. Once the joint is correctly positioned, tighten the screws. In order to adjust the joint adduction and abduction you must loosen the connecting screw between the joint and the thigh joint support splint. Each groove corresponds to 10°. Once you have found the desired position, tighten the screw. In order to adjust flexion or extension you must loosen the screw to take off the cap. Now you can remove or shift pins. The holes are at an angle of 15°. Once the desired range of motion is adjusted, reposition the cap and tighten the screws. How to use our medi Hip one hip orthoses. Date of issue: until June 2017. How to use our medi Hip one hip orthoses. Date of issue: from April 2018.